This salad has everything I love in one delicious dish; salty, sweet, tangy, colorful, and crunchy. The colors are only the beginning of the sensory overload. 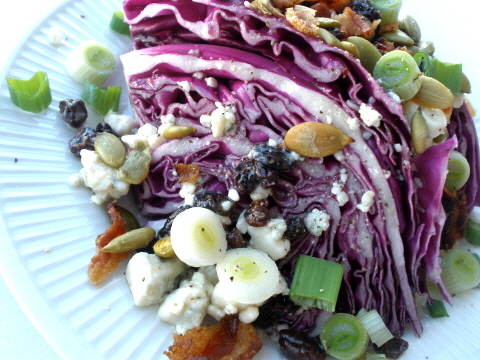 The crunchy, raw red cabbage lends a perfect back drop to the strong flavors of the dressing, and toppings. Great as a main dish or, serve a smaller portion for a wonderful side salad. Begin by preparing the vinaigrette. Combine EVOO, white balsamic, currants, and blue cheese in a small air tight container. Refrigerate at least 30 minutes, while prepping the other ingredients. On two plates divide cabbage, green onion, pumpkin seeds, and bacon evenly. Once dressing has chilled, spoon over both plates adding salt and pepper to taste. Serve immediately. Your company should help you with the 'serve immediately' part.